Well well 31 weeks, here we are! In some ways this pregnancy has flown by and in other ways I feel like I've been pregnant for a good forever. I think maybe it's because we anticipated this baby for quite a while before I got pregnant, and also because when I found out I was pregnant we were in a completely different home with some uncertainties of the future. Which all seems SO LONG AGO. I actually don't even have one bow yet. Further proof that I'm not going to be the best girl mom. Have I talked about how that makes me nervous? I know how to mother a boy. I know how to be a boy mom but HOW do I mother a girl? I DON'T EVEN HAVE ONE BOW. I'm already failing. In general pregnancy news I've been feeling good. I am iron deficient so I have to take an iron pill everyday, as I did when I was pregnant with Eli. I don't have any particular cravings, just hungry a lot. I still have a low-lying placenta, which means we are looking at a c-section. My birth experience with Eli was smooth and I had a great recovery so I never really entertained the thought of doing it any other way. I'm not opposed to the c-section, just a bit sad that things are different this time. BUT it's ok and I am pretty much over it. We have one more ultrasound scheduled and then the doctor will decide if I need a c-section date. 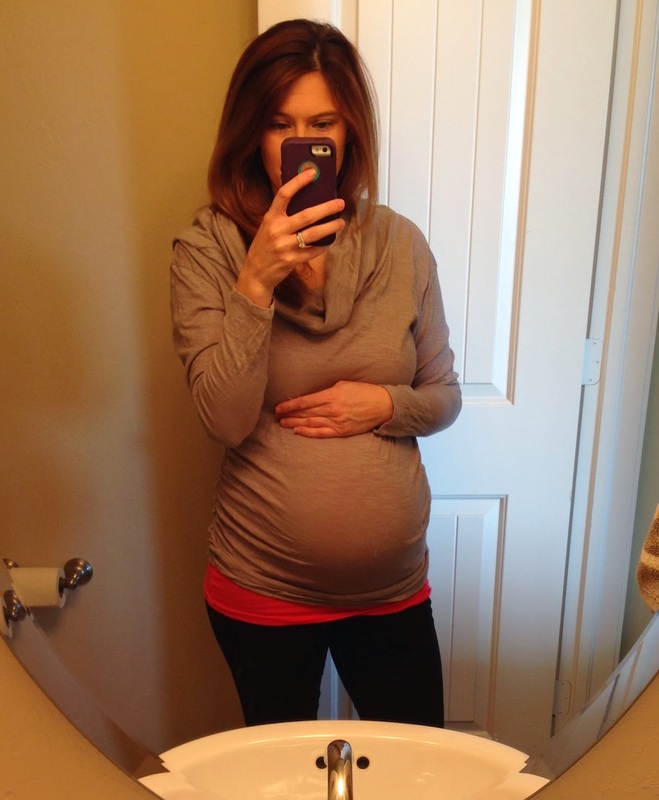 If the doctor decides on a c-section then I will for sure not be pregnant the full 40 weeks. Which means I don't have a lot of time left to be pregnant with Anniston. So each kick and wiggle and hiccup she has in there I'm cherishing. That is the best (and sort of creepiest) part of pregnancy is feeling that baby in there moving all around. Such a miracle. 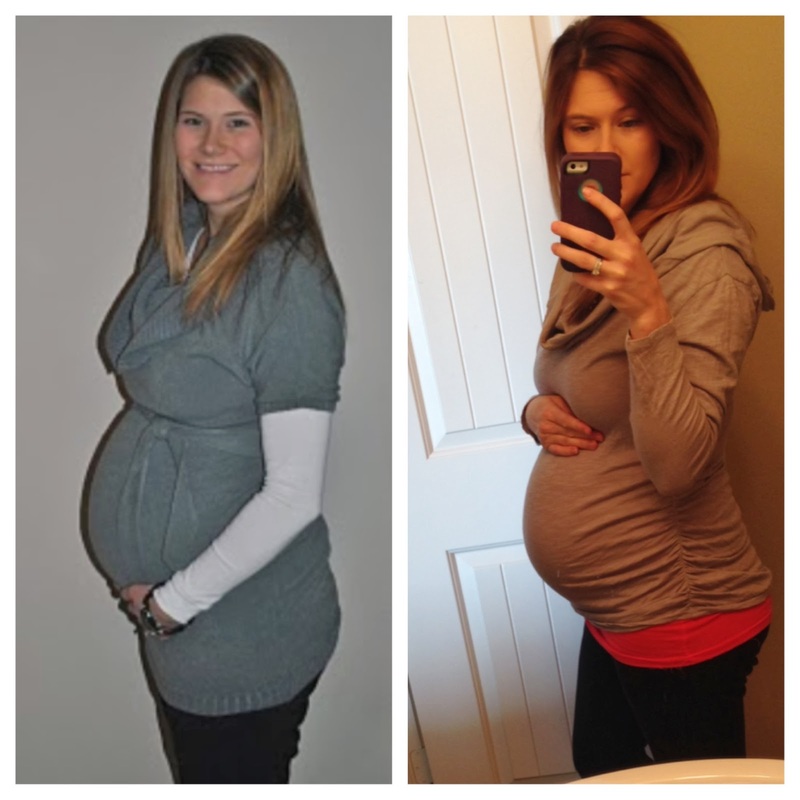 Here I am pregnant at 31 weeks with Eli (on the left) and Anniston on the right. 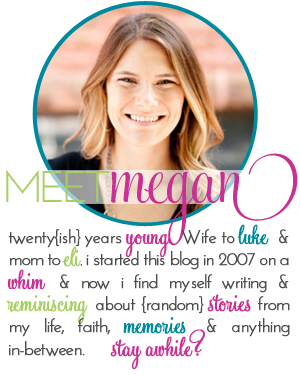 And a little fun Megan pregnancy fact when I was pregnant with Eli we had a very cold winter with lots of snow storms, then the next two years we didn't have any snow at all, then when I'm pregnant again we have another hard winter with a ton of snow storms. We are expected to get a lot more snow this week so we are potentially going to be snowed in. Perhaps I'll use that time to do some online shopping and buy some bows. If it makes you feel any better. I had a "natural" birth with my daughter and a year and a half ago gave birth to surrogate twins via c-section. I am being 100% honest when I say the c-section recovery was SO much easier on my body. The worst part was the 12 hours I had to stay in bed with these annoy leg compression things(they are are like blow up pillows that go over you calves and inflate/deflate every so often to help your circulation). But other than that I was fine! They gave me some type of morphine medication after the surgery, then after 12 hours gave me percoset(spelling?? )I only took those for the first day, and after that I asked to just take the ibuprofen and it worked like a charm. Yes it IS scary to think about a c-section but it's not horrible, I promise! Girl get those bows...it's really all you need for a girl! We had a boy and then a girl. I was terrified having her because I wasn't sure how to do diaper changes on a girl etc. then the last month she went breech and the dr said she was a he. A c section was scheduled, the dr prepared me for c section recovery and then she moved so the c section was cancelled. So I didn't have a lot of time focusing on my fears about how to care for her. I promise you that you'll do great. Mine had no hair and it was before those hats with bows, so bows were not something I worried about. Of course, I did have a fashion show or two with her. Today, she's 11 so I guess I got her through the baby days. Good luck to you. I had an emergency c-section with my son. I am pregnant with #2 and as of now my placenta is low lying too. It gets checked again in a little over a month. Google "Gentle C-Section" there is tons of info on how great it can be! I just love her name!! you are looking fabulous! bows can always come later...but stick them in there early if you want her to like them at all...I started early with Elyse and I normally get a few good hours out of one before she rips it out! I ended up having a c-section with Elyse and I think it would have been totally fine, if I hadnt' labored beforehand...a scheduled c-section would have been much easier on my body! Ahhh I'm so thrilled for you to have some bows and cuteness and a baby girl to love on!! She'll be fine with or without bows... and I know she will have some in the next 9 weeks FOR SURE. I forgot we are due around the same time! This is FLYING by for me. I have bought NOTHING!! We have been waiting on our tax return since I had to go out of work on short term disability and funds are limited! We should have it next week and I have a lot to do in order to get ready for the little lady! I love your maternity hoodie!! Where did you get it?? You look great by the way!